Visitors standing on the crater rim during an Etna summit craters excursion. Etna craters excursion will start in the morning. It's need to be at meeting point (Rifugio Sapienza at 1950m a.s.l. - Etna's southern slope) at 9,30. Having met your guide the excursion begins taking the cable car to reach quickly and easily the arrival station at 2500m s.l on the western flank of the Montagnola. There we'll take the 4WD bus and after twenty minutes will arrive at Torre del Filosofo (2900m) at the feet of the Etna's main craters (3340m). From there (2900m), climb to the summit craters (3315m, ca. 1-1.5 hours climbing, 300-400mm difference). The exact route of ascend and which of the summit craters can be visited will depend on weather, volcanological activity etc. 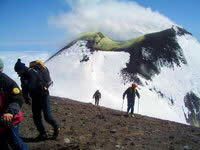 Spend ca.1-2hours in the summit region, descend to the point of departure (optional break at 2900m to observe the 2002-2003 eruption craters) reaching Torre del Filosofo. At the Etna top. Bocca Nuova crater rim. We'll leave the torre del Filosofo (2900m) and will descend the southern slope of Etna Volcano crossing the ash desert created by the last eruptions down to the 2001 explosive vent and to the Montagnola where the huge valle del Bove caldera is visible.Being back to the cable car arrival station (2560ms a.s.l.) will take it to reach the Rif. Sapienza area. Arrival time 4,30pm. Etna active craters, eruptive fissiures, cinder cones, spattern cones, monogenic cones, volcanic bombs, aa lavas. including a 4wd bus one way ticket + cable car return (both ways)ticket! 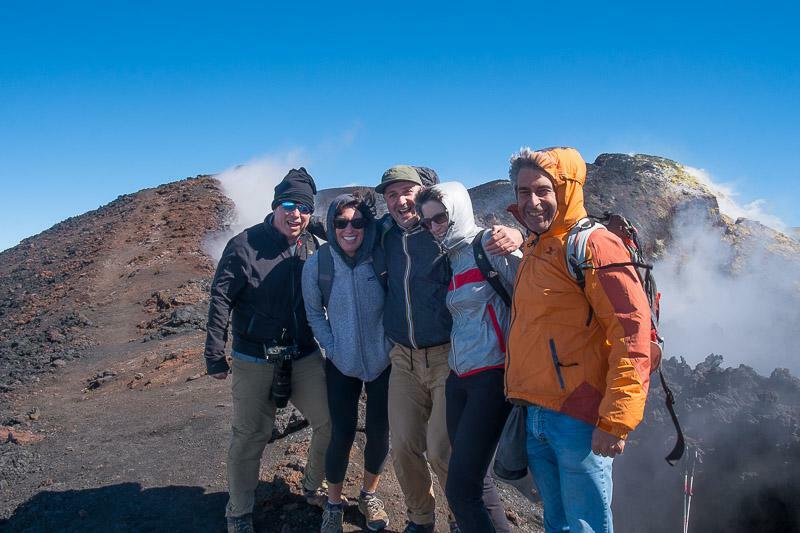 Etna is a high mountain and a very active volcano, so the possibility to climb the main Etna craters will depend on daily weather or volcanological conditions, because of that the Etna summit crater excursion itinerary can be modified on guide discretion.